It’s shark week!!! 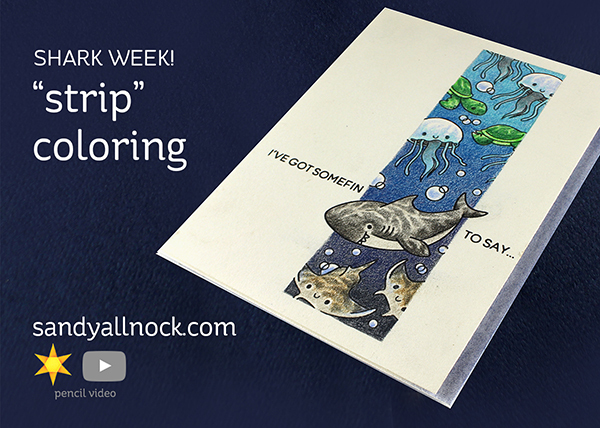 I have two videos with sharks this week…today in pencil, and Wednesday in Copic. So be sure to come back for more! In pencil it’s hard to spend as much time as it takes to do a full-background scene. 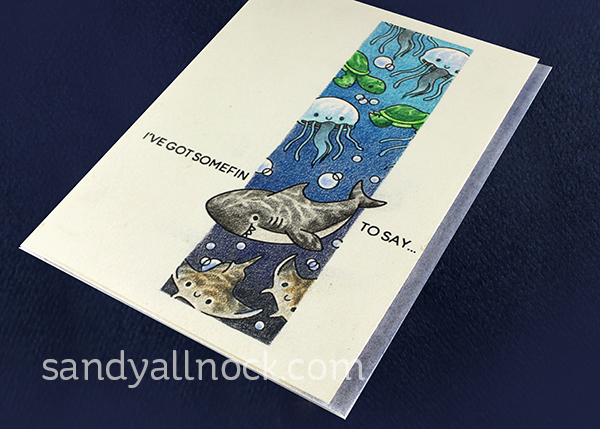 But if you can create a “strip” of imagery with a scene – and find a way to make it seem purposeful, like in this card where the shark pops out of the box – the coloring goes much faster! It’s colored on my new favorite Stonehenge paper – awesome for colored pencil! Watch the video below or click HERE to see it in HD on YouTube. The other sentiments in the stamp set make great inside sentiments like this one! The border of the inside of the card, as well as the strip of card base showing on the card front, are both using powdered pencil – a technique used in the Colored Pencil Jumpstart Class. 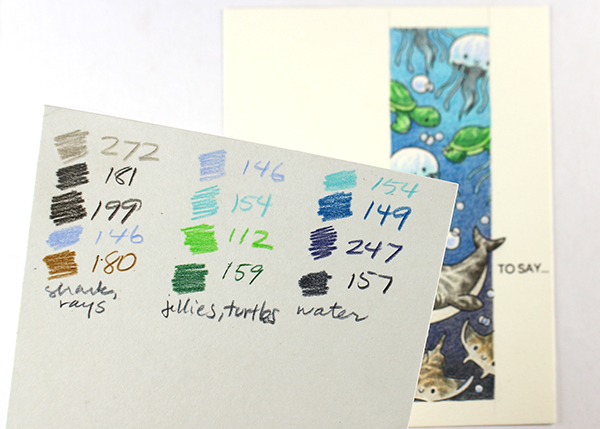 The Polychromos colors used here are as follows…I tried jotting them down in order of what they were used for. don’t know why, but the comment I left yesterday on this gorgeous piece of art is not posted. I love this card and that you used pencils, I don’t have Copics but I do have Polychromos pencils and although I learn a lot from your Copic colouring, pencils is different. I am saving hard to do your Jumpstart Pencil Class because I know for sure that there is much more to learn from you! Thanks for this gorgeous one! As always, love this — the coloring and especially the format/design. Oohhh…love this card. The shark escaping from the strip has given me a great idea. I love this card! Very different from other designs and catches the eye. Beautiful Card. Love the under water scene and the inside sentiment. Wonderful work Sandy!!!! Thanks so much for sharing! Awesome coloring, great color changes as the sea creatures got deeper in the sea! This is another awesome card Sandy. You just keep cranking them out! I like the strip coloring maybe because I like lots of white space. The dark against the white is gorgeous. Thanks for sharing this. I love the water reflections, makes it more realistic, especially on the shark. And the sentiments are punny! Love it. That is beautiful. Definitely going to try this technique. I have a lot of issues with water. Thanks for sharing with us. Great way to look watery! Always learn from you. I remember the first time, years ago, when I watched you color a ‘scene’. It looked so much like a Disney type of scene and I immediately subscribed as I wanted to see and learn more from you. I think it even had a little deer or rabbit, but sadly I don’t remember anything but that it was wonderful coloring and the trees and leaves had depth. So many years ago my brain has not saved all the details – I guess I need an upgrade, LOL.